The data for the first few weeks of this year suggests this isn’t likely to happen soon. In the off-trade fruit cider sales rose 8.5% in value and 7.6% in volume for the 12 weeks ending 26 March 2016 (IRI). And what’s more, fruit cider is becoming a bigger force in the overall cider market, having grown its value share to 29% of the market, with apple at 61% and pear at 10% (IRI, year to February 2016). This all indicates a rosy future for fruit cider. But alongside this, some producers are renewing their focus on traditional apple cider with some big investments being poured into this area; could this pose a threat to the future of flavoured options? Apple cider: a threat to fruit cider? Andrew Quinlan, who is the founder of Orchard Pig, says his company has been working to reinvigorate the market for apple cider for years but he doesn’t expect this to hinder fruit cider sales. “Apple’s versatility has kept it as the preferred choice,” he explains. “Rather than hit sales of fruit cider we need to use it as an opportunity to expand the cider market as a whole. People want to experiment with new flavours, as we're seeing with the craft beer boom, and there's no reason cider producers shouldn't become equally ambitious with their offerings and look beyond your standard flavours. “While fruit cider grew impressively, apple is still dominating the category because it is such a versatile ingredient,” he says. “This is where we see the next innovations in flavours, which is why we’ve created ciders like Maverick, which is infused with ginger and chilli; and our Marmalade cider that we recommend serving with toast. Meanwhile at Brothers Cider, sales & marketing manager Geraldine Doyle says the cider category as a whole needs to innovate to continue to drive growth. “Any growth in apple cider should help the category overall to maintain growth and should not be detrimental to fruit cider sales,” she says. But some producers believe the decline in sales of apple and pear ciders may not see a quick turnaround. In the off-trade apple cider sales dropped 5.2% last year while pear dropped 17.9%, according to IRI. Kopparberg’s Salvesen, says: “We expect this trend will continue as the apple and pear cider markets become more mature and take an ageing consumer with them. And Salveson points out that while its fruit cider portfolio is recording strong growth, Kopparberg hasn’t lost sight of its pear variant. “Although the pear category is in decline, Kopparberg Pear is the number one selling pear cider variant within the pear cider category,” he says. What are the flavours of the moment? While the majority of fruit cider producers welcome the renewed focus on apple, they are confident that their sub-sector will continue to pull in fans. 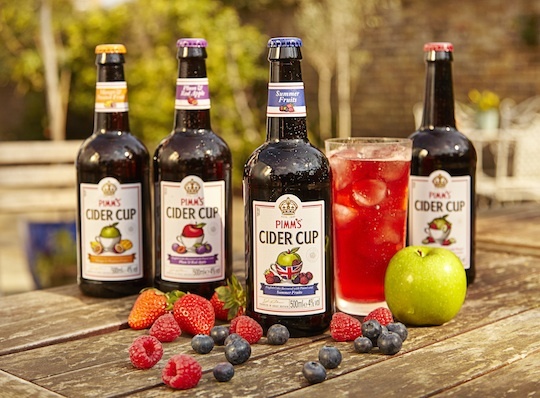 Diageo, which entered this category last year when it launched Pimm’s Cider Cup, says the brand is showing the best rate of sale of all cider innovation in 2015 in the off-trade (Nielsen). To support this growth it recently launched three new flavours to the Pimm’s Cider Cup range: Summer Fruits, Mango & Passionfruit and Plum & Red Apple. And Brothers reports of a continued demand for interesting flavour combinations. “This can be seen in the current strong performance of Brothers Toffee Apple Cider in the off-trade,” Doyle explains. It is the producer’s bestselling flavour with sales up 16.3% in value and 25.8% in volume (IRI, 12 w/e 26 March 2016). To appeal to those seeking new flavours, Brothers launched a Coconut & Lime cider last year. But it’s not just new flavours driving growth. Retailers across the country continue to highlight Strongbow Dark Fruit, which was launched back in 2013, as one of their bestsellers. And Kopparberg, which claims to be the UK’s best-selling fruit cider brand, says its Strawberry & Lime flavour is the best-selling variant in the off-trade, growing at 28%, while Mixed Fruit is the second best-selling variant in the off-trade. Both flavours were brought to the UK back in 2007. How might fruit ciders evolve? There continues to be plenty of innovation in cider, often linked to the fruit cider segment. Last year the producer brought out frozen cider in various fruit flavours, exclusively for the off-trade. And Premium Swedish cider brand Rekorderlig recently launched a range of Rekorderlig Cider Cocktails in individual slim 250ml cans, or in packs of 12. The range (Passionfruit Gimlet, Wild Berries Bramble and Swedish Punch) blends the cider with spirits and other ingredients. Meanwhile Doyle points to the United States where the cider market is developing in a different way. In April this year Brothers launched its own Hop Cider, which is a crafted blend of Apple & Pear Ciders, infused with Hersbrucker Hop extract, which the company says taps into the popularity of craft beers and is perfect for the summer months. And finally Diageo points to ‘spiders’ as the “third generation of the premium ciders evolution”.